Although Cozumel is Mexico's largest Caribbean island (and its most populated), it wasn't until the 1960's that this once-sleepy fishing village became a tourist attraction in its own right, following a documentary in which Jacques Cousteau declared it one of the most beautiful areas in the world for scuba diving. These days, Cozumel is a major cruise port that welcomes more than one million cruise passengers each year and as many as eight ships per day. But even with all this progress, Cozumel has held onto its non-touristy side; only one-third of the island has been developed, leaving large stretches of pristine jungle and sandy beaches basically untouched. Yes, it's true: There's much more to Cozumel than duty-free shopping. 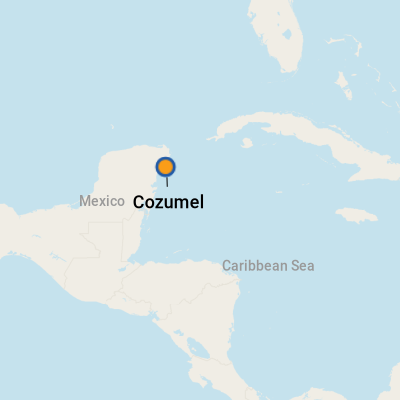 (That being said, Cozumel offers darn good deals on jewelry, Mexican handicrafts, T-shirts and other souvenirs, mostly in the main town of San Miguel.) This small island, measuring just 28 miles long and 10 miles wide, lies off the coast of the country's Yucatan peninsula and offers incredibly diverse options for water sports-lovers, partly because of its proximity to spectacular coral reefs. 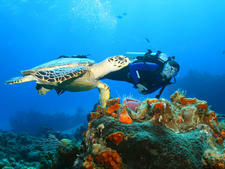 Along with snorkeling, beach bumming and boating, scuba diving is one of the biggest draws to this sunny destination. Cozumel owns a rich history. In fact, the island derives its name from the Mayan civilization that settled there approximately 2,000 years ago. According to Mayan legend, Cozumel was the home of Ixchel, the goddess of love and fertility. It's said that when religious temples were dedicated to her, she sent her favorite bird -- the swallow -- as a sign of her gratitude. For this reason, the people called the island "Cuzamil" -- Mayan for "Land of the Swallows." 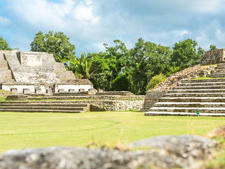 Several important Mayan sites, such as San Gervasio and El Cedral, populate the island. Even better preserved ones are on the accessible mainland; Chichen Itza and Tulum are hot spots for daytrips and shore excursions. Cozumel has three piers, all of which are found on the built-up western side of the island. Punta Langosta is ideally situated in downtown San Miguel. The International Pier, the oldest cruise ship pier on the island, is located about 3 miles from San Miguel (a long but scenic and safe walk). Carnival Corp.'s Puerta Maya, located about 5 miles from San Miguel, acts as a standalone destination, with restaurants, jewelry stores, local craft carts and a beach. The growing Royal Village Shopping Center sits right across the street from the International Pier. The complex features a cozy Wi-Fi cafe, Cafe Punta del Cielo, which sells coffees, sodas and delicious pastries. The mall is also home to about a dozen popular stores like Harley-Davidson and Swarovski, as well as a Hard Rock Cafe. 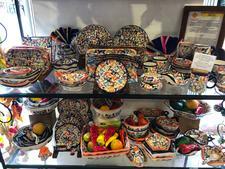 An especially fun store to browse for Mexican handicrafts is Viva Mexico at the intersection of Avenida Melgar and Adolfo Rosado. A shopping village with some two dozen souvenir shops, as well as another Cafe Punta del Cielo can also be found at the Costa Maya terminal. Be aware of mopeds, motorcycles and bicycles. They're prevalent, and drivers won't always yield to pedestrians. As you should when visiting any city, leave unnecessary valuables in your cabin safe. Finally, be sure to negotiate and settle on a fare before getting into any taxi. On Foot: Depending on your pace, downtown San Miguel is at least a 45-minute walk from the International Pier, and even farther for passengers arriving in Puerta Maya. It can get very hot, so most passengers opt to take a taxi into town or hop aboard a horse-drawn carriage. Once there, downtown San Miguel is very walkable, with most shops, bars and restaurants clustered around the waterfront. By Taxi: Taxis line up at the entrances to the piers and cost about $5 to $10 per ride to San Miguel, depending on which pier you dock at. Rates to the beaches can cost $10 to $15; to avoid being ripped off, be sure to ask to see the rate card and settle on a fare before departing. Word to the wise: Some drivers aim to overcharge for longer trips, so bargain carefully. Also, if you give the walk a try and decide midway that you've made a mistake, it is easy to grab a cab. Just wave when the driver toots his horn. Settle on a fare before he takes his foot off the brake. Renting a Car: Some passengers who don't take one of the shore excursions and want to travel on their own might want to rent a Jeep or four-wheel-drive vehicle. Beware of additional charges for insurance and gas. You'll find a Thrifty office right outside the International Pier and an Alamo at the Costa Maya terminal. By Moped: This is a popular and inexpensive way for one or two people to get around Cozumel, although many cruise ships warn against doing so because of the dangers of an accident while navigating among reckless drivers. Hidden stop signs and stretches of severely potholed roads also present hazards. By Fun Car or Scoot Car: These automatic-transmission buggies, resembling souped-up golf carts, are another possible option. They're able to reach speeds of 45 mph, and you can find the rental booth on the ground floor of the Punta Langosta shopping arcade. Local currency is the peso. However, most stores prefer U.S. dollars, so it's not necessary to change money. ATMs are located in several areas throughout the main plaza in Cozumel, near the cruise docks. Spanish is the official language, but nearly all shops and eateries have English-speaking personnel. Mexican arts and crafts like hammocks, jade jewelry, ponchos, carvings and leather goods, make great souvenirs. Tequila is also a popular take-home item; though the prices might not be the lowest on the island, the selection of premium tequilas at the Los Cinco Soles store in San Miguel is impressive. Note: Remember this about the sale of black coral, which is an endangered species: Though there are dealers wielding government-issued permits to sell the stuff, coral jewelry is listed on the U.S. Department of State's list of "wildlife and wildlife products" to avoid. Buyers risk confiscation and fines. No drink can beat the luscious giant margaritas served at Pancho's Backyard at the Costa Maya cruise terminal and in San Miguel, although the margaritas at Nachi-Cocom Cozumel Beach Club offer a steady challenge. Another tasty libation imbibed in many bars is the "michelada" (beer mixed with lime juice).